It’s 7:30am. We’re supposed to be at the Ohio Stadium to begin security screening for today’s commencement exercise for The Ohio State University. Before the afternoon is over, over 12,000 degrees will be conferred in front of approximately 70,000 people. 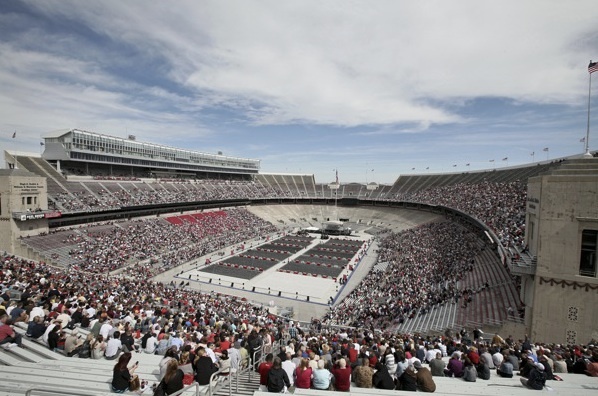 Over 70,000 people at Ohio State University’s Graduation, May 5, 2013. Today is different than normal commencements. The President of the United States, Barack H. Obama, is delivering the commencement speech, which is why we are instructed to be at the stadium 4.5 hours in advance of the actually commencement of commencement. Secret Service agents have been conducting nightly reviews of the stadium and all points surrounding the campus for over a month. They are extraordinarily thorough. We are in Columbus because my partner’s 23-year old is graduating from OSU. Another one will graduate in the same stadium next year. One has already graduated from an Ohio college, and between our two families, we will have experienced at least seven graduations of some type in the next several years. Cha-ching. Alas, we do not make the morning call. Four of us, including two siblings, unamimously vote in favor of sleeping a little more. What would we do for four hours at the stadium? We are strongly encouraged by both OSU and the Springhill Suites staff not to drive to the stadium, so we make the 1.5 mile walk in beautiful weather at about 10:20am, which takes approximately 20 minutes. We see the lines of people begin to emerge, and the worry sets in. Will we miss the President’s speech? Will they close the gates? As it turns out, we luck out on the best line in the place and spend, at most, 15 minutes waiting to go through metal detectors and get the cursory review from the special agents. This wasn’t TSA; it was secret service—A little bit more intimidating, although they were smiling and in good form. That was comforting, as we had already noted sniper agents on rooftops around the stadium. The procession is set to begin at 11:30am. It doesn’t. Only by 12:05pm do we see the first students make their way to the stadium floor—the first of 10,143 graduates who will receive their diplomas. Of course, not all students have their names read out of loud; that honor is reserves for the 270 doctoral degree candidates, and that process will last over 40 minutes later in the ceremony. But every graduating student will receive his or her diploma this morning on this great field, more known for its football team than graduating services. It takes about 45 minutes for the students to march in and take their places. The coordination of this affair is simply awe-inspiring. Everyone involved, including the graduates, knew what they were doing and there seemed to be no missteps. Once seated, the procession of special dignitaries, honorees, and OSU leadership enters the stadium. And on the massive high definition jumbo screen, he appears—President Obama. At once, the stadium gives him a standing ovation, just by showing face. 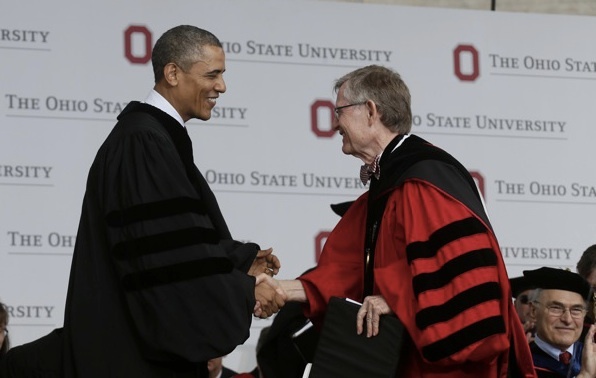 President Obama and Ohio State University President Gordon Gee. Gee is a different college President. He is perhaps the most loved of all campus presidents, but not because he is the highest paid in the country, nor that he arguably leads the financial growth of one of the largest universities in the country. Rather, he is different because he is highly accessible by all students. There is hardly a student at this 65,000-student university that has not had his or her picture snapped with Gee at some point during their undergraduate or graduate experience. He makes it his quest to find birthday students on campus at bars and restaurants to wish them happy birthday. Students proudly display these photos on Instagram and Facebook. Dr. Gee is an institution all of himself, and he does it well. And while Gee relishes this special opportunity, he also knows that everyone in the stands are there for two reasons: to celebrate their brother, sister, son, daughter, grandchild, or friend; and to hear and see the President of the United States. In his remarks, he asked graduates to do two things: participate and persevere. At a bare minimum, that means voting, eagerly and often—not having somebody drag you to it at 11:30 a.m. when you’re having breakfast…But participation, your civic duty, is more than just voting…Only you can make sure the democracy you inherit is as good as we know it can be. But it requires your dedicated, and informed, and engaged citizenship. And that citizenship is a harder, higher road to take, but it leads to a better place. It’s how we built this country—together. We’re blessed to live in the greatest nation on Earth. But we can always be greater. We can always aspire to something more. That doesn’t depend on who you elect to office. It depends on you, as citizens, how big you want us to be, how badly you want to see these changes for the better. Once finished, the exercise continued, first with the confirmation of honorary doctorates, which included famed photographer Annie Liebovitz, and concluded with a “doctorate in laws” to Barack Obama, who, while others donned the doctoral cap with the hood, donned an OSU ball cap to the cheers of the audience. This was the culmination of a long road for these students. One student, identified by Dr. Gee, took 15 years to achieve her diploma. Others overcame incredible odds and difficult circumstances to navigate to this point in time. Graduation is a very odd feeling and sense. As I told my partner’s son, “Congratulations on earning your degree. You worked hard and it paid off. And I am sorry that the easiest part of your life is now in the past.” This is the truth about graduation. The bittersweet feeling that what you have come to know and expect for at least the past four years is now over. The real world is waiting. And we know the real world is not storybook in nature. It is tough, if not unrelenting at times. President Obama reminded graduates to persevere, because they will ultimately face failure. He said that Michael Jordan is remembered for six championships, but not many remember his 15,000 missed shots. 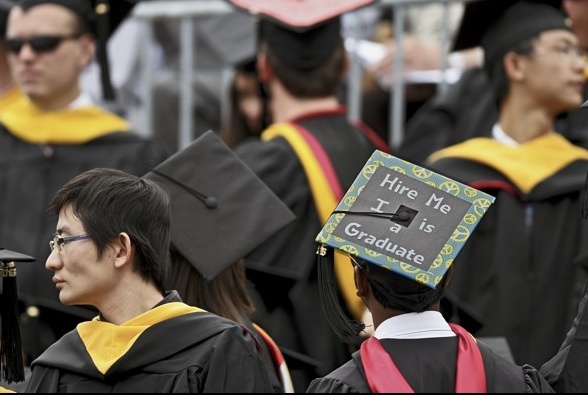 For today’s graduates, the world is your oyster. But it takes determination and perseverance. The job market is more challenging than at any time in our history. But the opportunity is also as great as ever. The parchment conferred upon you today is only a license to achieve more; not stand pat upon what you have achieved, but to help you achieve at higher and higher levels. This degree is your vehicle. The goal is much higher. Educational Policy Institute May 6, 2013 January 20, 2019 Graduation. Higher Education. President Obama. Gordon Gee. Ohio State University. Next Next post: How Much Mathematics is Enough?